Ranch dressing is known as an American favorite and has been the best selling dressing in the States since 1992. People put the famous sauce on salads, sandwiches, or they use it as a condiment or dip. Chicken wing recipes and ranch dressing, now go hand in hand. There are even some people that dip their pizza in the creamy sauce. When in doubt, a platter of vegetables with ranch will keep a crowd full. Ranch can come in all kinds of varieties and is enhanced with added flavoring. Garlic ranch is a favorite for dipping French fries. Other varieties of ranch like spicy ranch and BBQ ranch can be seen on menus all around the country. New innovations of the beloved sauce recipe can be found popping up every day. Copycat Hidden Valley Ranch Dressing - This ranch dressing is known for being the original ranch dressing and the best ranch dressing. 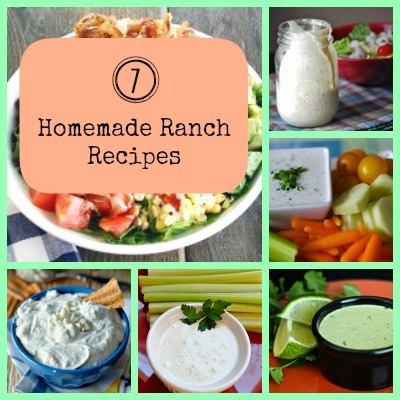 It is simple and will be your go-to ranch recipe. Low-Fat Homemade Ranch Dressing - Ranch is known for being delicious, but not necessarily healthy. This low-fat ranch recipe is tasty and guilt-free too! Copycat Outback Steakhouse Ranch Dressing - This restaurant ranch recipe is known for being packed with flavor. Homemade Outback Steakhouse Garlic Ranch - Fresh garlic makes this ranch recipe a great dip. Restaurant-Style Blue Cheese Ranch Dip - Blue cheese and ranch are a perfect match in this ranch dip recipe. Cheesecake Factory BBQ Ranch Knockoff - BBQ sauce pairs nicely with ranch in this recipe. This dressing is great for a Southwestern-style salad. Our Version of Cafe Rio's Cilantro Ranch Dressing - This Tex-Mex variation of ranch dressing is perfect for putting on everything, especially taco recipes!